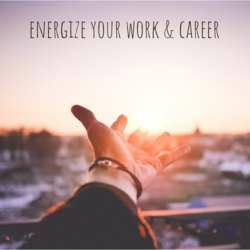 You are invited to join our next workshop where you will learn how to energize yourself and boost your career confidence while doing it. The two hour session will be led by one our most experienced and popular trainers, Vincent Deinum, founder of U Turn Coaching & Training. As usual, after the workshop there will be an opportunity to network and socialize among the participants. •	Why do I sometimes feel drained from work? •	How come I procrastinate certain tasks I know I need to do? •	What are the things that really energize me? Perhaps you recognize those days where you are full of energy and you have fun in what you do in life. And there are days that we have to do things we really dislike and we come home from work exhausted. Why? We will explore what gives us energy and how we are drawn to activities that allow us to bring out the best out of ourselves. We find ourselves drawn to them in different areas of our lives for example at work, at home and during our leisure activities. Some of them are very obvious to us and others are still undiscovered. Positive psychology argues that if we focus on developing and using more of the qualities that gives us energy it will help us increase our performance at work, feel happier and more connected to our jobs. It will be an interactive session with practical tips and tools that can support you in your daily life. Vincent Deinum has been involved with people's development for over 14 years. As a coach, physiotherapist, consultant, facilitator and community builder, he always focuses on the potential in people and how to unlock yourself to become who you are. Currently he works as a HR consultant for BeLife and helps organisations build positive work cultures, developing leadership and talents in the programs they offer. He is the owner of U Turn Coaching & Training where he coaches individuals in their personal development. He is also part of a cooperative called Build Your Movement that amplifies the resilience of social movements by putting people at the center. Drinks can be bought after the workshop at the location for small change. Please make sure to bring some cash.